Thankfully, there are many options that can help you get out of debt. 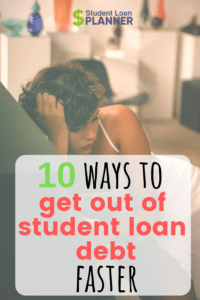 We’ve compiled a list of the 10 best strategies on how to get out of student loan debt faster. If you have federal student loans, there are several income-driven repayment (IDR) plans available. Depending on which plan you enroll in, you can have your outstanding balance forgiven after 20 to 25 years of payments. Keep in mind that while these plans allow you to keep more of each paycheck, you’ll pay more interest and end up paying more money overall with these plans. Despite these points, IDR plans can be one of the few viable ways to find student debt relief during income droughts. Student loans typically can’t be discharged in bankruptcy. The PSLF program will forgive the outstanding balance on your student loans after you’ve made 120 on-time payments. Federal, state or local government agency positions and jobs at not-for-profit 501(c)(3) organizations all qualify for PSLF. Unlike the Teacher Student Loan Forgiveness program (we’ll discuss this next), the 120 payments don’t have to be consecutive. The Teacher Loan Forgiveness Program was created to encourage excellent teachers to work in low-income schools. To see which schools qualify, check out the Teacher Cancellation Low Income Directory. To qualify, teachers must serve in one of the qualifying schools for at least five consecutive years. If you’re a highly qualified secondary math, science or special education teacher, then you can qualify for up to $17,500 of forgiveness. All other teachers who apply can receive up to $5,000. The Nurse Corps Loan Repayment Program will pay up to 85 percent of outstanding student debt for RNs and APRNs who work in a Critical Shortage Facility (CFS) or in an accredited nursing school. If accepted into the program, the Nurse Corps will automatically pay 60 percent of your unpaid nursing student loans over the first two years. And they can decide to add an optional third year to pay another 25 percent. If you don’t qualify for this program, there are more student loan forgiveness options for nurses available. Federal student loan assistance and forgiveness programs get a lot of attention. But many states offer impressive programs of their own. Why would states want to help anyone avoid paying student loans? The most obvious reason is to attract top talent to their state. For this reason, most state loan assistance programs are limited to those who work in specific fields. Physicians, dentists, STEM (Science, Technology Engineering and Math) professionals and teachers are just a few of the professionals that can receive state-based loan repayment assistance. Under the Military College Loan Repayment Program (CLRP), Congress allows each branch of the military to offer up to $65,000 of loan repayment assistance to new recruits. CLRP is only available to military members who have no prior service. The Army and Navy repays the full available $65,000 while the Air Force pays up to $10,000. The other major branches, unfortunately, don’t participate in the CLRP program. Some employers are now offering student loan repayment as a work benefit. Fidelity Investments, for example, blazed a path with its Student Debt Employer Contribution Program. Now dozens of companies have signed on to use Fidelity’s platform to help their own employees. Programs like this are still in their early stages, so it’s still a relatively rare benefit. We’re hopeful that more companies over time will try to get involved. Total and Permanent Disability (TPD) Discharge forgives the outstanding balance on your federal loans in the event that you’re permanently disabled. Many private student loan refinance companies don’t offer disability discharge. But yours may, so it’s definitely worth checking. This is a benefit no one hopes to take advantage of. But as a guide on how to get out of student loan debt, it’s relevant to mention. Federal loans are discharged when the borrower dies. Parent PLUS Loans are also discharged upon the death of the parent or the child. Like disability discharge, it’s hit or miss on whether private student loan companies offer death discharge benefits on their loans. If you have a private student loan, contact your lender directly to learn about your available options. When you first took out your loans, chances are your credit score was at its lowest due to a shallow credit history. But after a few years of handling credit responsibly, your credit score often rises. A stronger credit score helps you get better interest rates when refinancing or consolidating your student loans. Refinancing private student loans is almost always a slam dunk decision. But weigh the pros and cons carefully before refinancing your federal student loans as all federal benefits are forfeited once you refinance. When figuring out next steps on how to get out of student loan debt sooner than later, you have a lot of options. If you’d like to talk about which repayment options would work best for your specific situation, be sure to book your student loan consult today!